Does your brake upgrade include aftermarket calipers, or calipers from a different vehicle? Other “custom” hose builders will use universal ends with multiple adapters, introducing potential leak points into the plumbing system. But with access to a catalog of more than 1000 brake fittings, BrakeQuip Authorized Dealers make hoses that connect chassis A to caliper B without the need for unnecessary and unsightly adapters. Need extended lines for a suspension lift or high-rise motorcycle bars? Your BrakeQuip Dealer will make custom lines for the perfect fit. Most automotive brake systems operate between 850 and 1050 psi. Every BrakeQuip brake hose is pressure tested to 3000 psi prior to sale to ensure safety and performance, even under panic-stop conditions. Two layers of tightly-woven nylon braid ensure low expansion and high performance in our 1/8″ ID rubber hoses for brake, clutch, and other hydraulic applications. 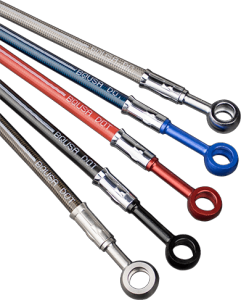 Our low expansion PTFE brake hose is reinforced with a 304 stainless steel braid. The smooth-bore PTFE core is compatible with DOT 3, 4, 5 (silicone-based), and 5.1 brake fluids, as well as gasoline, diesel, oil, propane, and most other fluids. BrakeQuip offers five colors for the PVC jacket. Low profile crimp on left; standard crimp on right. 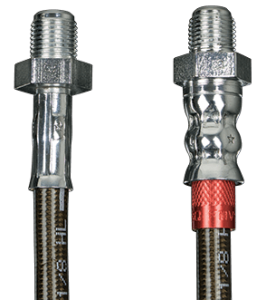 BrakeQuip low profile fittings are a natural fit for braided stainless steel hose. Standard profile fittings can also be used with braided hose when paired with a crimp shell insert. The Society of Automotive Engineers (SAE) categorizes brake hoses as regular expansion or low expansion. All BrakeQuip brake hose products are low expansion, as verified periodically by testing from an independent lab. Per the SAE J1401 standard, low expansion hose cannot expand more than 0.33 cubic centimeters per foot of hose length at 1000 psi. The most recent test sample of BrakeQuip rubber hoses had an average expansion of 0.11 cc/ft at 1000 psi, with individual results ranging between 0.10 cc/ft and 0.12 cc/ft. 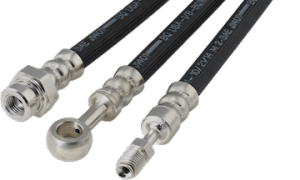 Similarly, the most recent sample of BrakeQuip braided hose had an average expansion of 0.07 cc/ft at 1000 psi, with results for individual hoses ranging between 0.05 cc/ft and 0.11 cc/ft. There are additional thresholds for other pressures. For example at 2900 psi, the allowable expansion for low expansion hose is 0.61 cc/ft. Our test sample of rubber hose averaged 0.30 cc/ft, with a max of 0.31 cc/ft. Our test sample of braided hose averaged 0.11 cc/ft, with a max of 0.15 cc/ft.